"Credulity is an extraordinary achievement. It is the best kind of interdisciplinary American studies scholarship, deftly navigating canonical American literature, critical theory, and archival sources, presenting them in sharp and engaging prose. Very few works of scholarship are both intensely smart and deeply pleasurable to read (and most are neither), but Credulity surely is, and it repays close, careful reading and rereading." "Mesmerism is an enthralling subject, and Emily Ogden has produced a particularly subtle history of its multiple embodiments in the nineteenth-century United States. . . . Throughout the book Ogden displays an impressive command over (and rapport with) her mesmerist archive. She uses that familiarity to question the ways in which scholars have been too enamored with enlightened notions of autonomy, agency, and empowerment to appreciate fully the mischief-making of mediums, somnambulists, and mesmeric subjects. Likewise, though, she sows doubt about the scholarly enchantment with enchantment—that it is not so much a mode of romantic resistance to rational disciplines, but another contrivance for modern operators to deploy against those who have not made similar progress toward secular modernity. Believe me, Credulity is a clever book." "What distinguishes Ogden’s account is her trenchant analysis of the various explanations proposed by mesmerism’s modern-aiming critics. . . . Among Ogden’s keen insights is her observation that iconoclasm invariably requires manufacturing one’s own unproven causal agency. . . . .Religious studies scholars will welcome Credulity as a lively assessment of the way that accusations of delusion or chicanery signal the gradual emergence of a secular consensus. They will particularly appreciate Ogden’s judgment that this process is mostly circuitous. . . . Ogden successfully supplements . . . previous histories by posing new questions and bringing fresh analyses to mesmerism’s somewhat paradoxical complicity in the emergence of both modern secularism and modern metaphysical religion." "A vivid account of the jagged intersections of science, modernity, and enchantment in the history of mesmerism, from its first flowering in eighteenth century France to its ambiguous fizzling half a century later in the United States. Ogden argues that mesmerism, rather than a clear-cut illustration of something like enchantment or disenchantment, lands in a contorted S-shape across those categories." "Ogden's marvelous book shows what secularism loves and not just what it hates, what it desires and not just what it wishes to get rid of; Credulity is, among other things, a study of 'debunking's pleasures.'" 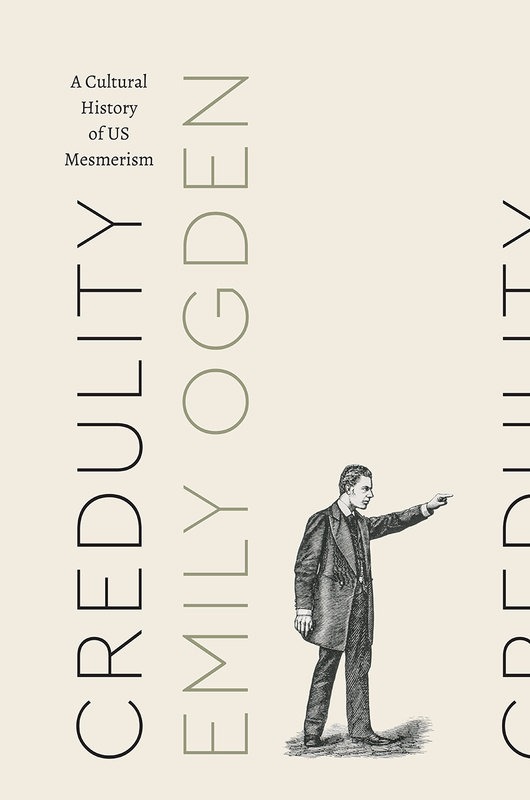 "The problems Emily Ogden deals with in her new book are by no means confined to the antebellum period on which she focuses. . . . Credulity is less a fully detailed narrative of mesmerism's ups and downs than a laser-focused inquiry into the constitutive role 'irrational' belief plays in maintaining rational supremacy." "What fine, fierce intelligence is here: with the deftest command of archival, literary, and theoretical sources and diamond-cut clarity of prose, Emily Ogden brings enchantment into view as a transaction by which the credulity of some ensures the modernity of others. A tool and not the vanquished other of enlightenment, the discourse of enchantment helped Americans who 'aimed at modernity' to negotiate the place of fiction, the management and monetization of labor, the conduct of colonialism, the care and company of the disabled, and the demands of secular agency. If I had a single book to recommend to students of nineteenth-century American culture, or to all who take pleasure in exquisite reading and writing, Credulity would be it." "Credulity is convincing in its arguments that disenchanters aim to control and calculate enchantment. Here modernity is embodied as a stance, constantly reinscribing the gullible foolishness of others to mark its own rationalizing, scientific territory."